In the past two decades, technological advancement in bike racks for cars has been conspicuous. Previously, bicycles would be transported using trucks and big vehicles, because they had space to fit in the tandems. In present times, you can move around with your cycles, regardless of their types, in the comfort of your car. The best car bike racks are the ones with unbeatable efficiency and those that you have purchased out of your own liking. We are here to give you an insight into the best there are in the market, then kick the ball back to your court for you to make an informed choice. Let’s dig in, shall we? See best bike racks for all vehicle types here. I . How much are car bike racks? II. 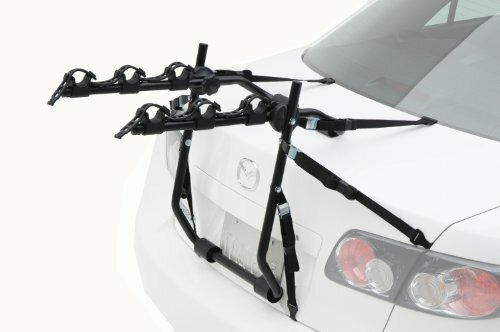 Who knows a credible place where to buy car bike rack? III. Are car bike racks universal? IV. Which car bike rack can I use on the roof? V. Any tips on how to choose a car bike rack? VI. How safe are car bike racks? The most durable bike rack is this particular one from Saris Bones. It is made from a non-rusting 100% recyclable material and can hold up to 3 bikes firmly. Saris Bones 801 bike rack mounts on the rack using injection-molded plastic arms and legs. Its hooks are vinyl-coated to protect the finish on the car from abrasion. It uses the arc-based design that fits on the spoilers of most cars to provide enough bike clearance. The stylish rack that comes in 6 different colors has ratcheting anti-sway straps which give your tandems a stable, secure grip while you are on the move. If you need to use the trunk of your car, you shall simply tilt the rack for space. Moreover, the rack is lightweight and lasts long, having been made from a non-rusting material. The stylish rack comes in 6 different colors, allowing you to personalize your choice and identify with the color you like most. It is also the best rack to use on your car since it has enough clearance for you to use the trunk. The rack lacks an integrated lock system, hence cannot be left unattended without giving thieves ideas. You have to purchase locks separately to keep it and your cycle safe. 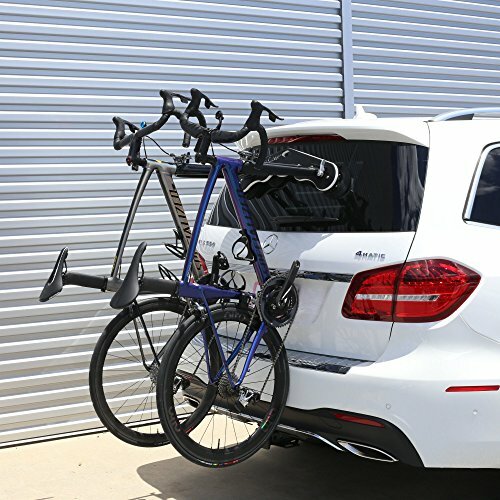 The most suitable rack to use when protecting the frame of your bike and the finish on your car is an Allen Sports trunk mount. 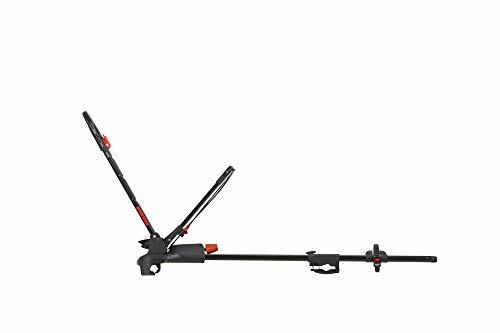 Allen Sports trunk mounted bike rack is pretty easy to set up, as it arrives fully pre-assembled; all you need to do is follow the installation instructions carefully. It is one long-lasting model with a limited lifetime warranty that serves you for ages. The rack has padded frames that protect the finish on your car from abrasion and gives the bikes enough clearance from being in contact. It is equipped with a narrow set of arms that hold 3 bikes of varying types. Its 2 straps on the side give your car lateral stability. When mounting your bicycle, use the tie-down straps for protection. The mount gives your bikes a firm grip that keeps them from swaying while you are on the move. The fact that it keeps your car and tandem from scratches makes it the best option for use to protect the paint and finish. This model from Allen Sports can really scratch your vehicle and make you annoyed if you install it incorrectly. The trick is in setting it up as per the well explained self-explanatory instructions in the manual. The rooftop carrier from Yakima is the best to use on all types of crossbars without third-party assistance. Yakima’s FrontLoader can be adjusted to fit on a variety of crossbars; the round, aerodynamic, square and alike. It needs no special tools for installation, as it comes fully assembled and it is easy to set up on the car’s roof. It is a good option for mountain and road bikes; it can hold a bike of 20-29” wheels without removing any of the wheels or being in contact with your bike frame. It is pretty tight, but if you want to improve the security of your items you can always buy SKS locks separately. The preassembled rack does not require you to have tools when installing it; the steps are easy and straightforward. It is to your advantage that it comes with a limited lifetime warranty. Yakima FrontLoader does not have an integrated lock system. Thus, it is mandatory for you to buy one separately if you intend to improve the security of your items. This has you incurring additional costs on the already costly equipment. 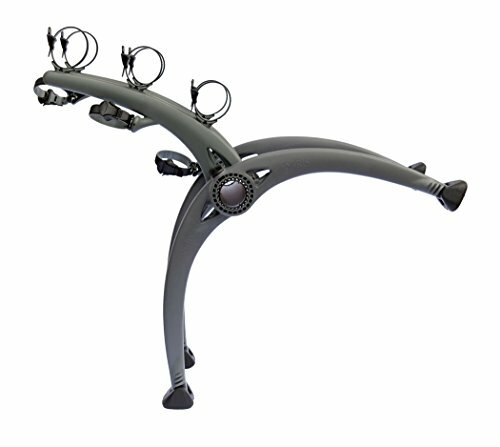 It is the best option for anybody in search of a long-lasting, strong bike rack that comes at a pocket-friendly price. Hollywood racks express bike rack is suitable for mounting on the trunk of your car. It is one of the most affordable one in the market. The rack is sturdy and can serve you for ages. It has long attachment straps that hold your cycles firmly, and they are easy to use. You need not worry about the finish on your bike – the soft rubber cradles on the rack will keep it protected. This sturdy mount can hold up to 3 bikes. It comes preassembled, and it takes little effort to have it installed. When done with it, you can fold it and fasten it with its integrated tie-down strap to keep it securely stored. The fact that the rack mounts on the trunk firmly and protects the finish on the bike makes it a viable option among many. It is also highly unlikely that your 3 mounted tandems will knock and scratch against each other. The rack has nylon straps without Velcro tips. This makes the strapping process less smooth. However, it does not beat how easy it is to use, regardless. You can relax now if you are in search of a 3-bike carrier with operational cushions to protect the car and bike paint. 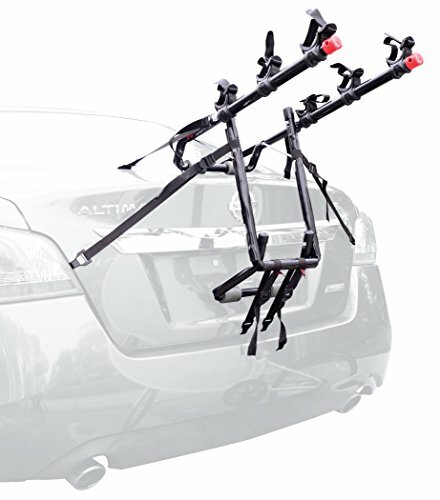 Thule Gateway 3-bike carrier is the best to hold 3 bikes with their finish intact all the way. It has hold-fast cradles that provide the bike with maximum security and are cushioned to protect the finish on the frames. Its anti-sway cages ensure that the tandems are neither in contact with the car nor with themselves. It is one type that can be locked to the car and allows you to lock your cycles onto it. This is only possible if you purchase the Thule cable lock and Thule passive lock strap respectively, separate from the rack purchase. If you have non-convectional bike frames like those on kids’, women’s and full-suspension bikes, you will need to buy frame adapters as well. The rack that holds up to 3 bikes securely is easy to mount on the car and fits perfectly on the vehicle such that it cannot shake when you drive. It is an efficient rack worth the price. The rack requires you to buy frame adapters to fit unconventional types of frames, thus an extra cost for such bike owners. Among most versatile bike holder is this one from SeaSucker. It fits on the roof, back glass and trunk on basically any vehicle. SeaSucker Mini-bomber is a versatile bike rack that uses 6 easy-to-use SeaSucker vacuum mounts to mount on your car. It can be installed on the roof, back-glass or trunk of your sedan, or any other vehicle type you have. The rack is suitable for any bike type with quick-release front wheels since it uses heavy-duty fork clamps to hold 2 bikes. This requires you to remove the front wheel of your tandem. If you have to lock up your items, buy lockers separately. This universal bike rack is not only suitable for your car, but also for any other type of vehicle. It makes it the best to buy if you have more than one type of vehicle. The rack does not have an integrated lock-system; thus, you have to purchase lockers separately. This definitely means that you cannot leave the rack in use unattended. The one thing you must have in mind is that each vehicle has a rack specially designed for it. Trucks have different ones as compared to RVs, and so do cars when compared to SUVs. For this reason, you need to customize your purchase to fit your vehicle and your preferences as well. Some of the preferences you may take into considerations are the ease of use, how stylish they are and their weights. Other major things to consider include the ones below. The type of rack you choose for your car is dependent on your usability of the trunk, the number of bikes carried and your budget. Below are the types of bike racks commonly used on cars that you should know about. Note that some types of bike racks are not suitable for cars. For instance, a hitch bike rack is a grand choice, but will not work on a car without a hitch receiver, and neither will a spare-tire bike rack because cars lack spare-tires that are mounted on the back of the car. These are installed on the rear of the car and fastened using straps. They are the most common ones because of their ease of installation and how light they are. They often hold two or more bikes securely. You will need to buy locks to keep them away from thieves’ possession. For roof bike racks, the rear view of your car shall not be hindered. You shall install this type on the rooftop of your car; be keep to the type of crossbar you have before purchase. Note that most of them adjust to fit on various crossbars, are light and accommodate one bicycle. This is the type that mounts on basically any viable surface. There are those that use vacuum mounts to install on the rear glass, the roof or trunk of your car. They can be used on other vehicle types as well. They cost much, but are worth the price, last long and can hold more than one bike, depending on the model. As mentioned earlier, all cars have racks that complement their usage. Be sure to find the right rack that suits your locomotive. There are those that need particular types of crossbars to mount the rooftop rack, while others are adjustable to fit any. While at it, look into the type of bicycles you intend to transport. Some have conventional frames that cannot be carried by particular trucks, hence may need you to purchase adapters for the job. Others have fat tires and fenders, hence requires particular carriers. How much are you willing to part with? There are mounts that cost as little as $50, while some cost more than $200; how much can you afford to spend on a shopping spree? Note that the inexpensive ones are very functional and last longer. The dear options are perfect for their brand names, robust material used and technology applied in making them. Make an informed choice. Are you more of a lone rider or a people’s person who usually has company on these rides? If you often transport one bike, buy a rack that accommodates one bike at a time. Most roof racks fit one bike. 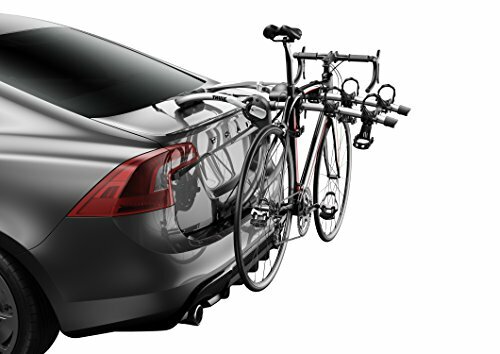 For those who want to move around with 2 or more tandems, trunk bike racks are suitable for you, as well as roof racks that hold more than one tandem. How often do you move about? Knowing your usability will assist you in choosing a bike that fits your preferences, if you are a frequent user, a lightweight rack will work for you. This is because you shall keep erecting and removing it from your car. If you shall use it once in a while, the ease of storage, rather than weight, should be your driving factor. Also, how convenient is the rack? Do you mind removing the front wheel? Shall you have help from a colleague in using the rack each time? You see, such questions assist you in coming up home with the right answers in the form of a great bike rack. There are those racks that cannot let you access the trunk easily once mounted. This should not be a problem at all if you have no use for the trunk; it can obstruct it forever for all you care. However, if you always have items in the trunk and use it often, consider a trunk rack that can tilt to enable your access. You can also go for the rooftop option in this case too. The types of bicycles you carry matter because some racks can only accommodate a particular range of wheel sizes and tire sizes. There are also those that cannot mount unconventional frame types. Have such facts in orders and seek advice on the same from your seller before making a purchase. Buying a bike rack does not mean that you can accommodate a mediocre item that will get you repainting your car and bicycle every month to clear the scratches. The best bike racks are built to protect your locomotives from abrasion and have enough clearance so that the tandems and car are not in contact with each other. There are, however, those bikes that do not need protection. Could be the frames are not worth the trouble, or the bike was really cheap. If this is your case, then do not worry about a rack scratching your bike, move on to other weightier factors. It depends on the particular bike rack you are eyeing. Normally, their prices vary depending on the material used, tech add-ons and company reputation. For $45-$100, you can find a good one. There are also those that cost between $140 and $300. It is all up to your budget. If by universal you mean they can be used on other vehicles, then yes and no. There are racks that can be used on cars and on other vehicles like SUVs and minivans. These include trunk mounts, roof racks and the universal racks themselves. However, there is no way you will use a car trunk for your car on a truck bed; where is its trunk? A Yakima FrontLoader bike rack will suit you best. It comes pre-assembled and is easy to use. Moreover, the rack makes no contact with you tandem when mounted, and can fit on a wide range of crossbars, including aerodynamic, factory, round and square crossbars. You can consider a SeaSucker Mini-Bomber as well if you do not mind unmounting the front wheel of your cycle. It is a rack that can be mounted on your roof, as well as your rear glass and trunk. How many bikes do you intend to transport often? How frequently will you use the rack? Are you comfortable removing the front wheel of your cycle? How often do you use your car trunk? Car bike racks are very safe. When installing them ensure that you follow all installation instructions to the latter. If you do, then you will achieve the maximum safety intended for you by the manufacturers. However, if you are careless in the steps, for sure, you, your bike and your car shall not be safe. Also, to keep your items safe, purchase locks to enhance security. Most car racks do not have an integrated security system in their racks, but there is always the provision of purchasing a lock recommended to you by the product developers. Buying a bike rack for your car is not the hardest thing, and neither is choosing the best there is in the market. Why would it be? Having read the through the handpicked best bike racks for your car, and internalized the factor to consider before making a purchase, you already have your pick in mind, don’t you? We recommend a roof rack for your car if you use your trunk frequently, want to transport two bikes or less and do not want to take chances in obstructing your rear view. A Yakima rack will do. If you do not want to increase the height of your vehicle and have like 2-4 bikes to move around with, a trunk rack will do. Otherwise, a versatile rack can work for all your vehicles.